Having recently started a Flickr account I came across the Bansky group pool, which allows Flickr users to post their pictures of Banksy work from around the globe in one place. 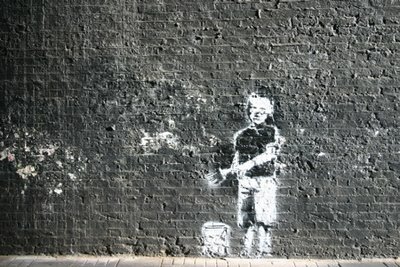 While checking out this group pool, I came across a planned Banksy mini walking tour in London. This tour will be the third walk that photographer Martain from Shellshock has organised, the first tour visited the Shoreditch area, with the second tour visiting Waterloo, South Bank, and Victoria Embankment. The third walking tour is planned for Tuesday 22th August 2006 with a 6.30pm start and will cover the Barbican/Farringdon/Clerkenwell area. The mini walk I"m told, will last probably just over 1 hour and take in mainly Banksy & Eine works in the area. There is no charge for the tour and you do not need to book a place, just turn up on the evening. Meeting point details for the evening, will be announced on the website shortly.